Most restaurants with famous hamburgers grill the patty on a hot flat metal surface called a plancha. You can get the same results with a cast-iron skillet or comal, heated to the highest temperature on a stove, but you may have a problem with smoke and hot grease splatters in your kitchen. The easy solution: Put the cast-iron outside on a gas grill, and cook away on the hot hot surface. Heat the cast-iron skillet or comal on the grill, using high heat, for 10 minutes while you prepare the beef. Mix the salt and pepper into the ground chuck with a chopstick or fork, handling very lightly. Make the patties about 4½ inches round, and about ¾ inches thick. The best weight for a hamburger patty is 5 ounces. Indent the center of the burgers, so they won’t bulge up from the steam while cooking. 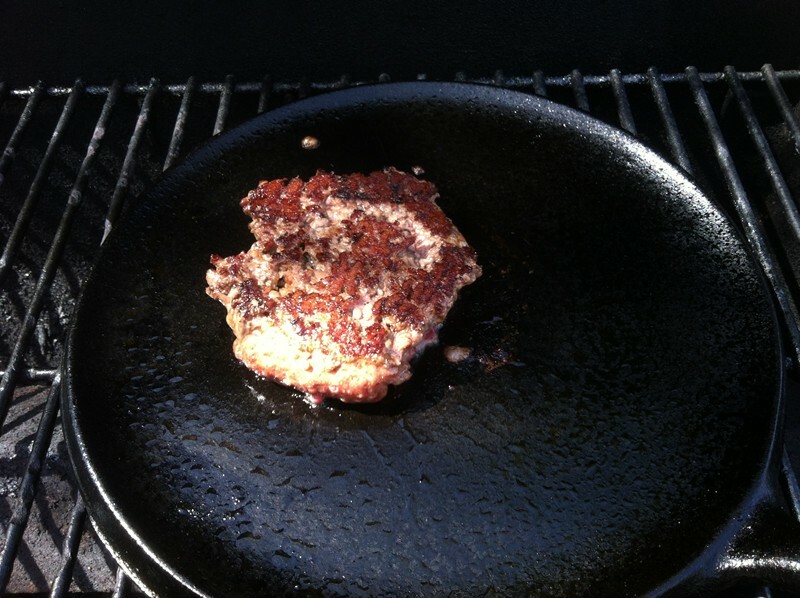 Set the burgers on the hot cast-iron, and let them sear for 3 minutes. Flip the burgers, cook 3 minutes more for medium-rare, or 4 minutes for medium. Stick an instant read thermometer in the burgers, from the side, to get the right doneness. The safe temperature is 160°. Add slices of cheese for the last minute of cooking if you want a cheeseburger. I prefer Cheddar, Provolone, or Pepperjack. Toast the buns for a minute over the direct flame on the grill, or Texas Toast them by buttering the cut side and grilling them for a minute on the hot cast-iron after you’ve cooked the burgers. 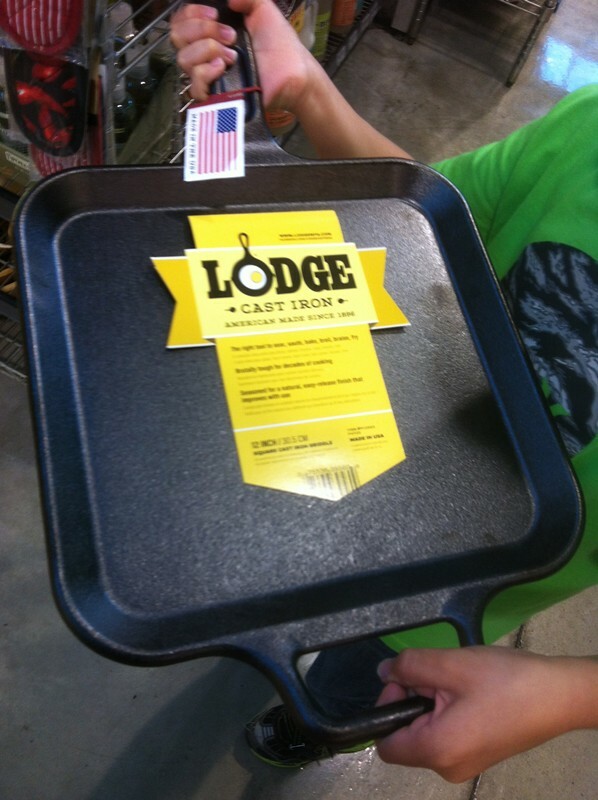 If you are cooking more than 4 burgers, you might want one of these big Lodge griddles, about $30. 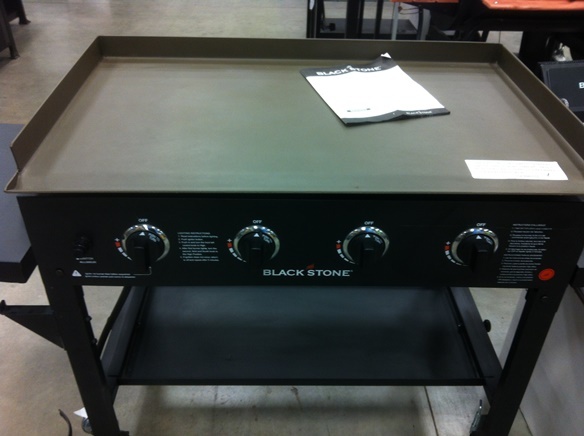 If you cook a lot of burgers, you can find an outdoor propane flat-top grill at Lowe’s for not a lot of money. This grill would be excellent for cooking breakfast, too.